Now that we have all the game components, we can add the game logic that dictates how a player interacts with the blocks and plays the game until it is won or lost. The gameCanvas item is the exact size of the board, and has a score property and a MouseArea to handle mouse clicks. 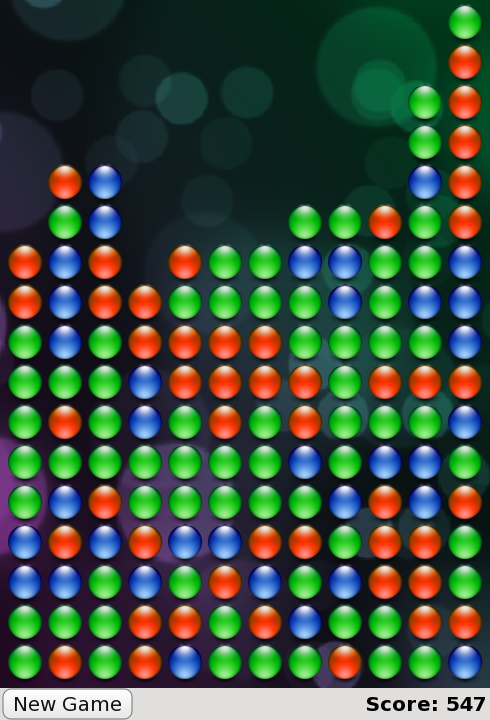 The blocks are now created as its children, and its dimensions are used to determine the board size so that the application scales to the available screen size. Since its size is bound to a multiple of blockSize, blockSize was moved out of samegame.js and into samegame.qml as a QML property. Note that it can still be accessed from the script. Note that if score was a global variable in the samegame.js file you would not be able to bind to it. You can only bind to QML properties. This updates the gameCanvas.score value and displays a "Game Over" dialog if the game is finished. We give the dialog a z value of 100 to ensure it is displayed on top of our other components. The default z value for an item is 0. The game works, but it's a little boring right now. Where are the smooth animated transitions? Where are the high scores? If you were a QML expert you could have written these in the first iteration, but in this tutorial they've been saved until the next chapter - where your application becomes alive!